Who needs a gym when you have a toddler? Winter’s in full force outside my little apartment in Montana, and I am not wanting to hibernate. The snow level is increasing outside, and my itch from cabin fever is growing. I need to get my heart rate up. I need to move around. I need to not sit all day and gain 10 pounds over the next few months. Last year, my youngest daughter was six months old about this time, and she enjoyed watching me bounce and wave my arms in a jumping jack–like movement from her bouncy chair. This year has been a little more difficult. We can go for walks with her in the backpack, but it’s not enough. I need to sweat and get out of breath. As a Solo Mom, the opportunity to work out isn’t always at the ready. I live a block away from a gym, but I’ve only been there once to check it out. I suggest a workout that doesn’t require getting a babysitter or gym fees. Before starting to exercise with a baby strapped to your body, be sure the carrier is a good fit. 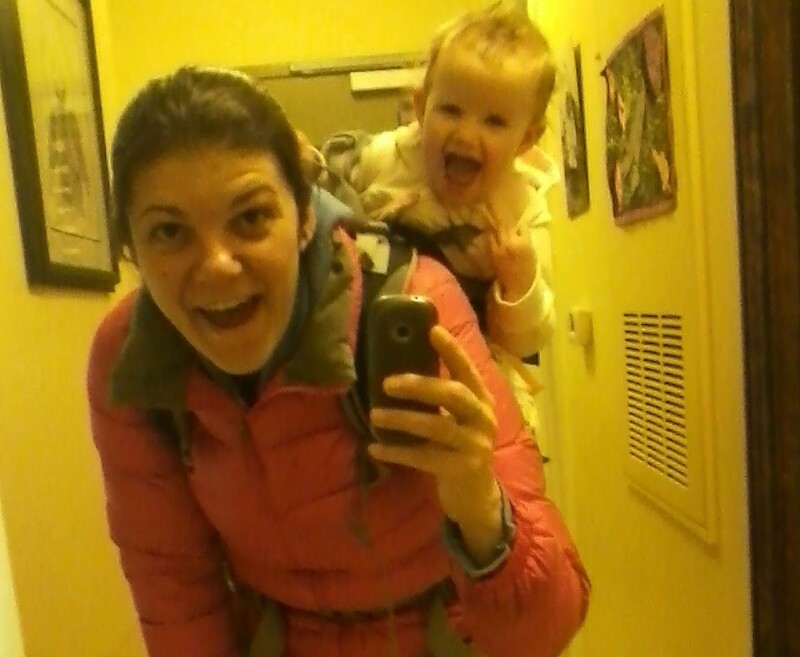 I either use an Ergobaby carrier or a tight-fitting backpack, like a Kelty, that doesn’t allow the baby to teeter from side to side and possibly knock you off balance. If you are postpartum, don’t overdo it, and take it at a slow pace while letting your body adjust to no longer carrying an extra 40 pounds in your belly! It’s as simple as going around the block a few times. Just 30 minutes a day can make a difference. You’re already challenging yourself by carrying the extra weight of the baby, but you can push yourself even further in short stints. Try walking fast for 90 seconds, then slow. If you don’t want to count, walk fast for one block, and regular for another. You don’t even have to commit yourself to 30 minutes if you’re feeling especially swamped. Park farther away from the entrance of the store, take the stairs, or opt to put your baby in a carrier instead of a stroller for shopping. These are my favorite. They’re like exaggerated walking and easy to do around the house. I have a tiny apartment, but I can walk from the kitchen and down the hall to my bedroom in lunges and feel it after just a few trips. Make sure you’re wearing good shoes and there aren’t any obstacles that could (literally) trip you up. It helps me to put on funny music and make weird noises as we dip up and down. Same goes for squats! I have a full-length mirror in my hallway, and it’s an ideal place to do squats. I can keep an eye on my form while the baby gets to check herself out in the mirror every time I get down in the squatting position. It helps to practice this one without the carrier first, keeping an eye on where your feet are placed and how your body is angled on the dip. As always, try to keep your abs engaged. Think of it as a wall push-up. Start with your feet a foot or two away from the wall, and place your palms flat on the wall at shoulder height. Bend your arms and do a standing push-up. For a greater challenge, back your feet away from the wall more, but make sure you’re on a nonslip surface or wearing shoes with a good grip. I am rarely not carrying my baby (who is quickly becoming a toddler and putting on quite a bit of weight). I usually have her resting on my left hip, and that arm’s bicep is way more bulked up and defined as a result. So I thought, Why not put this kiddo to use? One thing I’ve done that my daughter absolutely loves is lifting her straight over my head and out in front of me. I lift or press, extending my arms, and do it three or four times. What’s vital when doing these is paying attention to keeping your abdominal muscles engaged—and not overdoing it. It’s also ill-advised to do this one after a feeding. You can get creative with this one. I’ve done full circuits where I lift her from the floor to chest level, out front and back, then up above, repeating on the way down to return her to the floor. The babies love it, and it’s surprisingly a really good workout. I tend to carry my baby everywhere instead of bothering with strollers. The added weight allows me to get more out of walking or whatever it is I’m doing—from mopping, folding laundry, or running into the store. All these little things add up, even if they’re at five-minute increments. Five minutes of marching in place here or bouncing a baby to sleep there all count as being active. There are definitely days as a Solo Mom when it’s hard to get off the couch, and just making meals and cleaning up afterward is a total chore. That’s OK, too. That’s your body telling you to rest and take it easy. Recovery days are just as important as days where you get out for 30 to 60 minutes to walk. What’s important is maintaining good posture when you’re exercising, and even when you’re holding and lifting your baby. Those abdominal muscles have been put through the ringer, and they need to be kept in check to support you again. Keep your carriage strong, and try to keep from slouching to build stronger back muscles so exercising and carrying the baby around are easier. It really doesn’t take much to see results, and your baby will love the movement while being close to you.